RICE operates through the core leadership of four people: Andy & Haimi Walter (owners of the school), Clare Solomon (Principal) and Enatenesh Taye (Deputy Principal). Andy & Haimi have been married for nineteen years and have two children in middle and high school. Andy, who is British, has lived in Ethiopia for sixteen years. 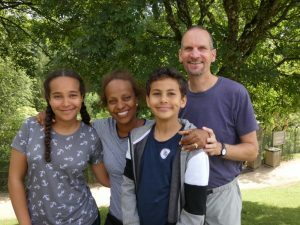 He taught for two years at a rural bible school in Soddo, southern Ethiopia before moving to Addis Ababa, where he was involved in teaching and administration at the Evangelical Theological College for the next six and a half years. From 2011 to 2014, Andy was Project Manager at Bingham Academy where his responsibilities included leading the school through accreditation with the Association of Christian Schools International (ACSI), fund-raising for the new High School building and instigating a school-wide database. Andy has a Masters degree with the University of London in Applied Educational Leadership and Management. Haimi was born and raised in Addis Ababa. She attended Commercial College where she completed her Diploma in Secretarial Science and Office Management. After marrying Andy in 1999, Andy and Haimi moved to the UK for two-and-a-half years during which time Haimi studied for a Diploma in Counselling and Theology at the London School of Theology. Upon returning to Ethiopia in 2003, she started working for the Summer Institutes of Linguistic (SIL) in Personnel and has remained with them ever since. Clare is from the UK and has been an elementary school teacher for the last 17 years. She began her career teaching at a Christian school in the UK for 8 years before coming to Ethiopia in 2007 to teach at Bingham Academy. In the UK she taught children from 5 to 9 years old and since being at Bingham has taught up to 11 year olds, thus developing experience across the whole elementary school level. 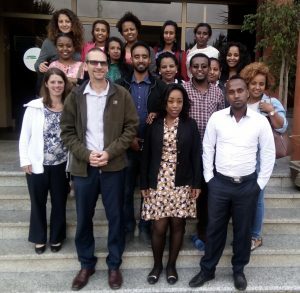 At Bingham, Clare coordinated the Amharic program, leading and developing the Ethiopian teaching assistants, and co-ordinating the Cambridge Primary program throughout the Elementary school. In her final two years at Bingham, Clare was the Assistant Elementary Principal. Enatenesh has been with RICE since the beginning in August 2014. She taught a joint class of Year 3 & 4 in her first year, and then in August 2015 she taught Year 5. Recognising her leadership abilities, Enatenesh was asked to join the leadership team in August 2016 as Deputy Principal with the aim of giving her responsibility over the Elementary school. She is now our second Principal alongside Clare. David Perkins has also joined us this year, along with his wife Jen. Both David and Jen are teaching Literacy and David has been working alongside the leadership team as a third Principal.